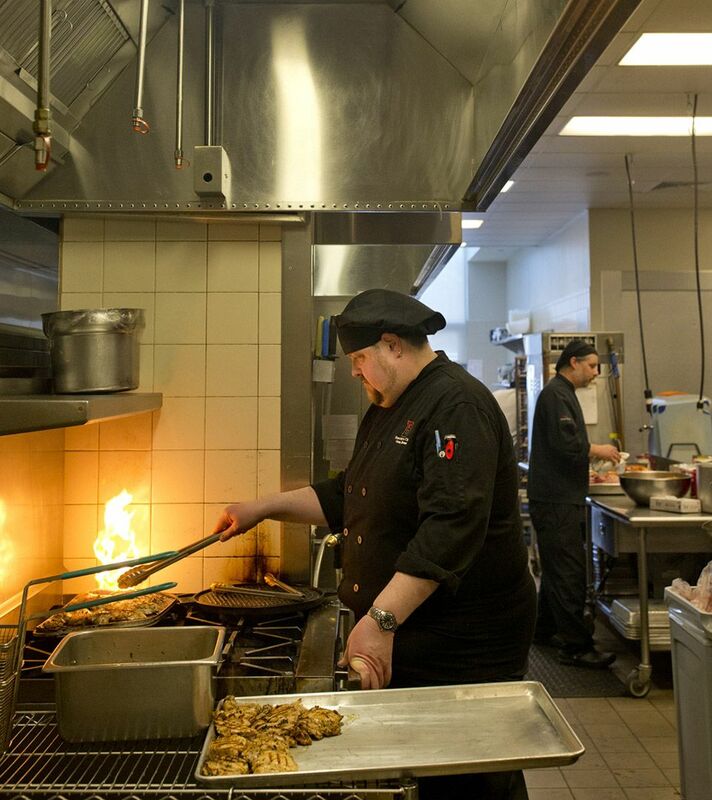 As they turn on ovens and exhaust hoods in Commons at 4 o’clock each morning, the college’s bakers and chefs are among the first people to throw switches each day at Bates. Within a few hours, Dining Services is humming with upwards of 14 different exhaust hoods removing heat, smoke, and fumes (ooh, bacon!). All those fans cost money to run; money’s also spent to pull millions of cubic feet of “makeup air” back into the building to complete the ventilation cycle. The Bates hoods used to run all day long and well into the night — but no more. New optical and temperature sensors on 11 of the 14 exhaust hoods know to turn the hoods on when things are cooking and off when the stations are idle. The Intelli-Hood sensors are part of an opportunistic and strategic $1.5 million investment in energy-efficiency projects over the last three years. Coupled with comprehensive and careful management of the college’s energy-use systems over the last several years, Bates has lowered its utility costs from a high of $4.5 million in fiscal 2009 to a projected $3.5 million in fiscal 2017, an impressive 22 percent decrease. When a campus comprises 170 or so buildings stretched across some 130 acres, the work to keep down energy costs and reduce emissions is constant. But there are spikes in the year-to-year activity. 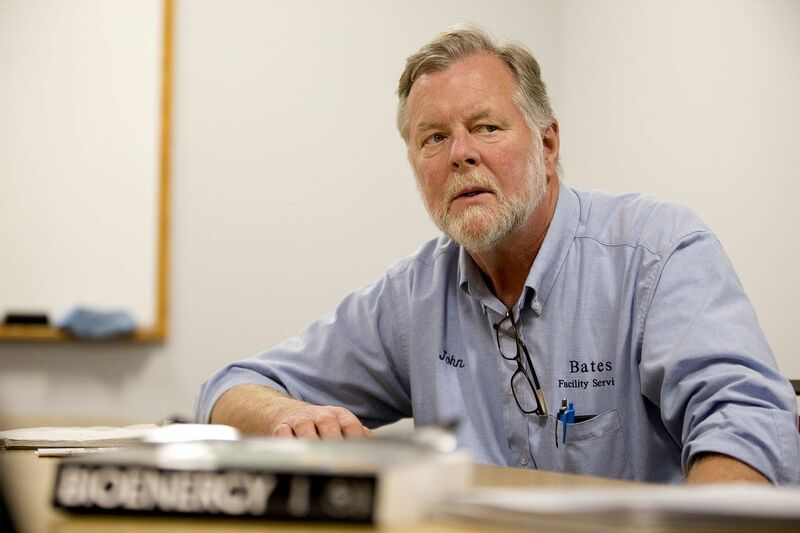 The current round of projects moved to the front burner in 2014 after Bates energy manager John Rasmussen presented a five-year plan of various cost-saving projects to the Board of Trustees. The report showed that “some of the individual measures had two- or three-year payback periods,” Rasmussen says. 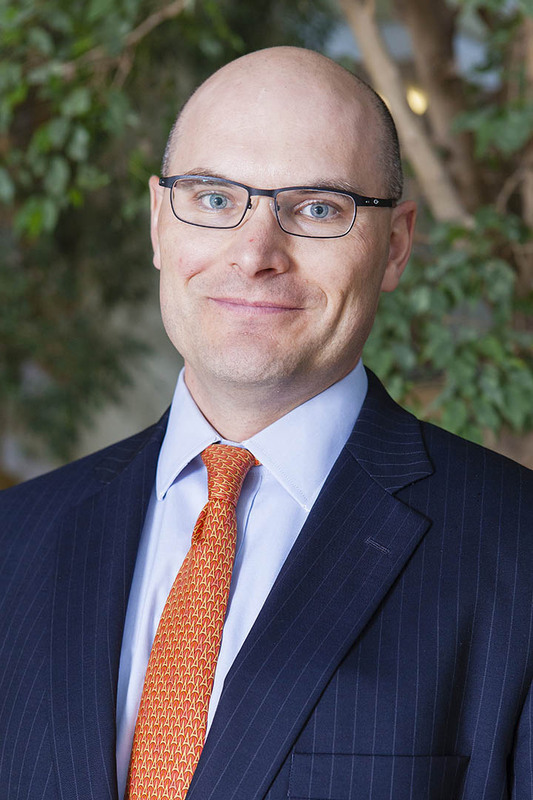 The board was more than intrigued, recalls Geoff Swift, who arrived in 2014 as the college’s vice president for finance and administration and treasurer. “It was clear that they had a strong appetite” for going after the quick-turnaround projects. “They didn’t want to pass on the low-hanging fruit,” Swift says. Besides cost savings, the cherry-picked projects have reduced the college’s carbon emissions by 12 percent, to 12,061 metric tons of carbon dioxide equivalent in 2015. While Rasmussen deals with the same challenges as his predecessors — “we have a very old campus that we overheat, over ventilate, over cool, and over light” — he has state-of-the-art tools that help bring that low-hanging fruit even closer to the ground. The exhaust sensors in Commons certainly fall into that category. According to various case studies, the Intelli-Hood units cut the cost of running exhaust fans by up to 75 percent and reduce the need for makeup air by up to 40 percent. At Bates, this single improvement is expected to save $60,000 annually. Homeowners know about heating and cooling, but less about ventilation. For a college, efficiently ventilating large buildings is a big and expensive part of the three-pronged HVAC equation of heat, ventilation, and air-conditioning. New technology makes possible what is called “demand-controlled ventilation,” or DCV, which brings outside air into a building only needed, exemplified by the exhaust hoods in Commons. Another way that DCV works is through CO2 sensors that estimate how many people are in a building. More people means more CO2 being produced, which means more ventilation is needed. CO2-based sensors are buildings like Merrill, Carnegie, Ladd, Underhill, Dana, Gray Athletic, and Olin. Those buildings also have start-stop controls that deliver both “accuracy and intelligence,” Rasmussen says, because they know when to kick on the heat in order to get the building comfortable in time for the first 8 o’clock class, for example. Not all the recent projects are high-tech. Bates has replaced several hundred windows in dozens of buildings across the campus. While the financial payback period for new windows is relatively long, up to eight years, the goodwill payback is quick. “They make the occupants happier.” (True that: we’ve gotten new windows in our Bates Communications offices on Nichols Street; no more drafts and rattles on windy winter days). 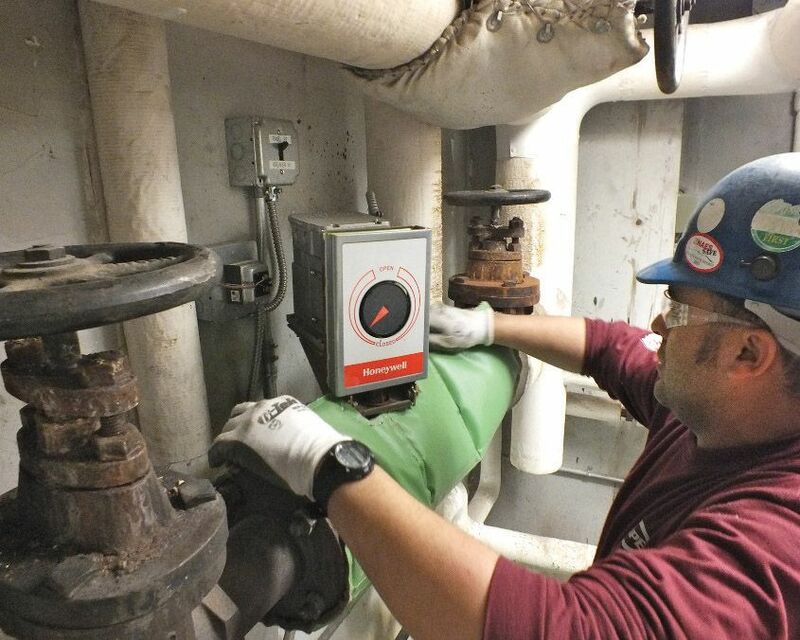 Another recent project tackled the challenge of hard-to-insulate heating components, like valves, fittings, and flanges, in various mechanical rooms on campus. For this project, Rasmussen called on a local company, Auburn Manufacturing, to install its modular and removable insulating product, Ever Green Cut’nWrap, on 500 hot-pipe components in 18 mechanical rooms on campus. The project will reduce the college’s emissions by 202 MTCE and save $34,589 annually. “I call that a win-win situation,” Rasmussen says. Including materials and labor, the project will break even in just 15.2 months. Some Bates buildings still await the Rasmussen treatment. In those cases, he uses the old-school methods. “I’ll look for open windows when I walk around campus,” and occasionally stop in when he sees one. Additional reporting by Stevie Jones / Gemini Connections.